With a name like Cherry Blast, Boku Slots had to investigate this game a little further and what we discovered was pretty impressive. Created by Iron Dog Studio they have certainly come up with something that puts a twist on the traditional video slot game. 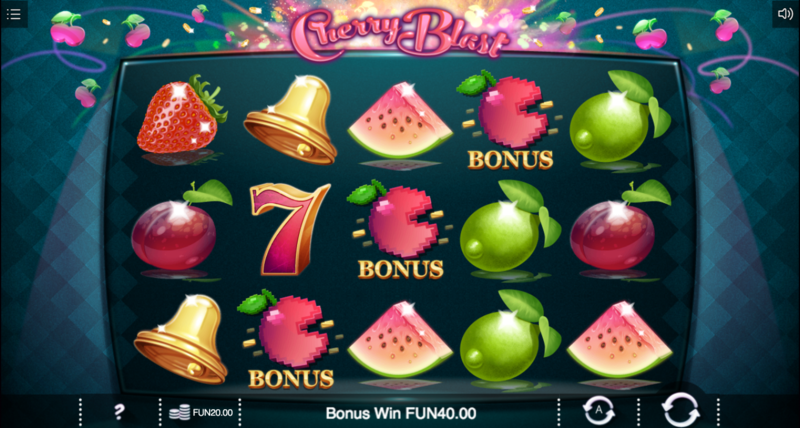 Cherry Blast is a 5-reel, 20 fixed pay line slot game, that offers a tasty 96% RTP for players to take a bite into. It is actually themed around your traditional slot symbols of fruit, 7’s and bells, but with a more modern design and a few hidden extra’s. The soundtrack is almost reminiscent of a 70’s cheesy cop show, but we can forgive them for this as it actually works quite well. 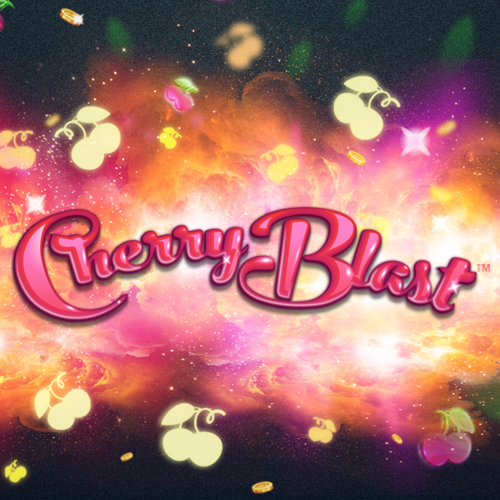 Bet Amounts – Betting on Cherry Blast begins at just 20p per spin and can be adjusted up to £40 per spin if you wish, with lots of choices in between to suit all pockets. Wild Symbol – A very elegant wild symbol is depicted with the word ‘wild’ wrapped around a crown. It will substitute for all other symbols except the 3 bonus symbols and of course the scatter. Scatter Symbol – As with the wild, the scatter is depicted by the word wrapped around a crown. The scatter itself only offers extra wins instead of bonus spins. If 3 scatters are found on a winning line in the main game, it will pay out x80 coins for that win. But, during the bonus games it offers pay outs for any combination of a scatter symbols, from 2 up to 9 found on the reels. To give you an idea of the bonus round pay outs, 2 scatters will pay 50 coins, but 9 scatters will pay 2,000 coins. Bomb Symbol – This is an interesting twist for you on Cherry Blast, because when the bomb lands it will only be on the central position of the reels. However, once it lands it will explode outwards and turn the surrounding symbols into a possible 5 wilds, 3 scatters or bonus spin symbols. This triggers quite often and can be very helpful in creating the bigger wins. Star Bonus Feature – Land yourself 3 of the star symbols anywhere on the reels on Cherry Blast and you will be allocated 9 bonus spins. During the bonus spins you will be given a double cherry bomb symbol, which when they explode give you a super wild or super scatter symbol. This will then make a path between the cherry bombs converting the symbols in between, to match the wild or scatter that was revealed. Dash Bonus Feature – Spot three Pac Man style symbols on reels 2, 3 or 4 and you will trigger the dash bonus game. You will then be taken to a new screen offering 5 pathways through a maze. You have to pick which path you want to take and then the Pac Man symbol will begin to move along the path. The symbol will collect prizes along the route of the chosen path until it hits a purple dot, which will end the round. By choosing a higher number path you are offered bigger prizes, but there is a greater chance of you hitting a purple dot so choose wisely. Cherry Blast has been a fabulous game to play, the design and music go well together and isn’t too off putting. The wins came often enough and we loved the addition of the bomb bonus, and the little Pac Man themed bonus game as well. The betting cost isn’t too high and this along with all the features and extras, make it a very popular game and we can see why.